Rain, rain, go away: Rain is very in-season this summer. Please be prepared to experience some delays in Maria Hassabi’s performance if the skies open up. Don’t worry, the show will go on. We may just have to wait it out together. For the most up-to-date information on tonight's performance, head to our Twitter account. On July 7 and 8, the Don River Valley Park Art Program presents STAGING - undressed, a new live installation work by acclaimed New York-based artist Maria Hassabi. Featuring a team of seven dancers, including Hassabi, STAGING - undressed is presented as a living sculpture with no beginning or end, using time as a technique and as a subject. STAGING focuses on the contours of stillness or slowness, while addressing the ways in which the spectacle of performance is presented within exhibitions, and in relation to architectural environments and public space. In its “undressed” iteration for Evergreen, out-of-doors and away from its institutional and architectural setting, the work invites the context of public space to influence the sculptural form and become its new stage. Hassabi’s work often encourages new relationships to the transitory spaces we tend to move through without notice. In Toronto, STAGING - undressed will unfold over several hours along the Lower Don River, as visitors come and go, or stumble upon an unexpected performance. The framework of STAGING - undressed is thus widened to include mannerisms of viewers or passersby, creating the potential for any action in the public space to be seen as choreography. STAGING is a co-production of Evergreen/Don River Valley Park (Toronto, Canada), Aarhus 2017 (Aarhus, Denmark), Walker Art Center (Minneapolis, US), and documenta 14 (Kassel, Germany). Co-presented by Evergreen and the City of Toronto, the Don River Valley Park art program launches this year with a series of site-specific temporary art installations and performances by local, Canadian and international artists along the Don River. 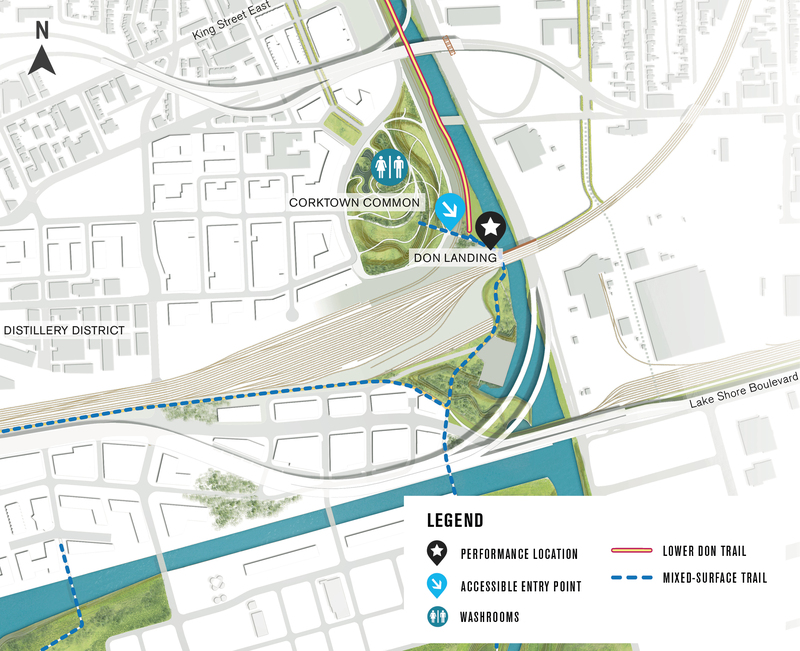 The performance will take place at the Don Landing in the Don River Valley Park, located near Corktown Common. See map below for details. Attendees are free to come and go at any time during the performance. Please dress for the weather and bring drinking water. Washrooms are located close to the site. There will be two performances, one on July 7 and one on July 8, 2017.